The iPhone SigCap Plug-In is an add-on for signoSign/2. The Plug-In comprises of the iPhone Capture Plug-In for signoSign/2 (with cost) and the free app “SigCap”. The iPhone SigCap Plug-In additionally gives signoSign/2 the potential to capture the signature via iPhone. Due to this combination there is no need of a Signature Pad. 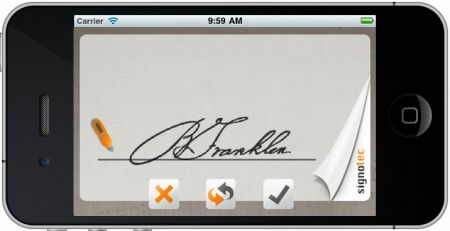 You sign on the iPhone and the signature will be transferred to the electronic document, which is displayed in signoSign/2 for example on the PC or Notebook. The whole solution is working offline, there is no need of an internet connection or a Server-Backend.